Browse: Home /	Recycling, ZERO WASTE / Flatbush Supper Club report! 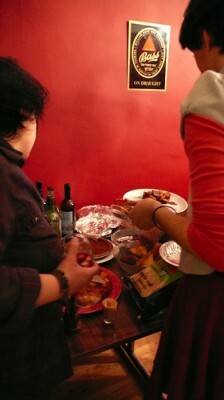 Thanks to everyone for coming to my place for the first ever Flatbush Supper Club on November 1st. 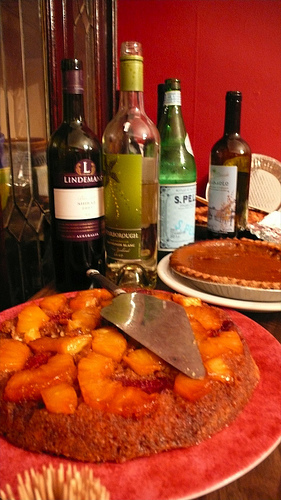 We had a great turnout and some delicious foods, drinks, and especially desserts, including several seasonal veggie dishes (braised cabbage, roasted root veggies, cauliflower, roasted squash, and blue fish soup), lovely sangria, wine, and sparkling cider, and lots of pies: apple & pumpkin, plus pineapple upside down cake and vegan oatmeal cookies. I love the variety of potlucks! Delicious and so filling! We began the night socializing and then started our Zero Waste discussion, inspired by Elizabeth Royte’s book Garbage Land: On the Secret Trail of Trash. Talking trash is a heavy conversation, but I hope people left thinking about issues, learned things, and thought about how they can reduce their own waste. I’m looking forward to continuing the exchange at our next event. The challenging question is: given all we know and are learning, WHAT CAN WE DO?! I think this is the ultimate question that we have to search ourselves and each other to answer in a meaningful way, and it can’t happen in one evening. Ultimately, for ourselves, children, and the future of the planet, we must all work towards Zero Waste. San Francisco has a goal of reaching Zero Waste by 2020. New York City’s goal is 70% waste diversion by 2020, but in 2007 we only reached 16.5%, far from our goal of 25% for that year. In terms of trying to answer the question, WHAT DO WE DO?!? !, I mentioned the work Coquille and I have embarked on this past year out of our own frustration at the lack of school recycling. Last year we wrote letters, op-eds, and petitions, and saw results by organizing meetings, bringing people together, creating a website and blog (www.educatingtomorrow.org), and working with City Councilman Bill DeBlasio and his staff. Because of our efforts there was a hearing in June 2008 at City Hall in which the New York City Departments of Education (DOE) and Sanitation were raked over the coals about the school recycling issue. Since the hearing the DOE re-wrote Recycling Regulations, hired additional staff, and has mandated principals to appoint recycling coordinators. This year we are continuing to push for strict recycling compliance in schools by organizing the United Federation of Teachers (UFT) Green Schools Committee. We’ve also worked on creating our own school recycling programs and written lessons on waste issues for our students. I mentioned some of the videos I’ve shown my students and offered to bring them to the next Flatbush Supper Club event so we can watch them together: Garbage Warrior, Gone Tomorrow, The Works: Garbage, and Our Synthetic Sea. We ended the night by feeding the worms (who live under my kitchen sink) fruit scraps from the sangria. Zero Waste… it’s the way of the future… how do we get there as individuals and as a society? Let’s continue the conversation and learn from each other! 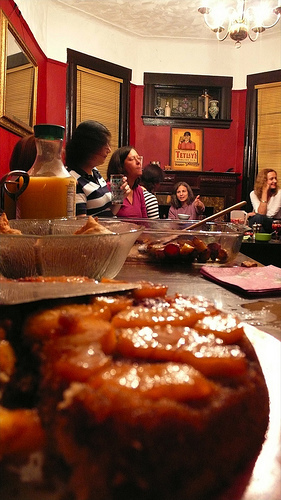 I look forward to seeing you at the next Supper Club for great food, company, and compelling discussions! To learn more about Micki and Coquille’s work, check out their website, Educating Tomorrow. This site also has great resources for teachers who want to learn about or share environmental education tips and support each other’s efforts and ideas. The next UFT Green Schools Committee monthly meeting will be held on November 20th at 4pm (these meetings are posted on the Sustainable Flatbush calendar). 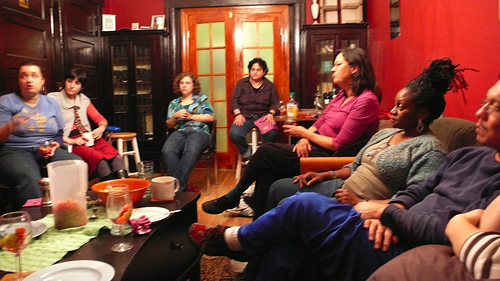 Join the Flatbush Supper Club network, a partnership between Sustainable Flatbush and GreenEdge Collaborative, to receive updates on future events!